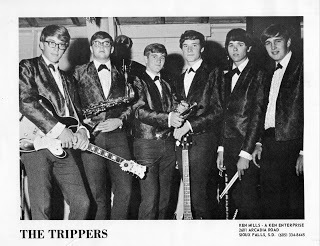 In the mid 1960s there were a lot of good garage bands in the Sioux Falls area but the Trippers were one of the best. They formed in 1966 and consisted of Mike Ward (vocals, keyboard, trumpet), Mark Henjum (vocals, lead guitar), Terry Park (drums), Mark Griffin (organ and sax), and Gordy Haugan (bass). The following year Chris Harper (lead vocals) was added. Henjum and Park were the only members with the formal music training. The guys were very dedicated and as a result of daily practices they became more polished and gained a lot of confidence. The Trippers auditioned for Ken Mills, who was quickly building a reputation as one of the best agents and promoters in the area. Ken like what he heard and immediately started booking the band. Since the Trippers admired the Flippers and Red Dogs they also became a show band, complete with blue tuxedos. They initially played a lot of high energy music, songs by the Rolling Stones, Wilson Pickett, and Sam and Dave. Soon they expanded their horizons to include Tommy James, the Doors, and Byrds tunes. Their venues included area ballrooms, schools, armories, and legion halls. They were opening act for the Lovin Spoonful and Neil Diamond when they performed in South Dakota. In the fall of 1967 Mike Ward left the group but they continued as a five piece group, even recording a couple of records in the Twin Cities. "Have you Ever" became a regional it and Kaleidoscope/Conquistador were also popular. The band eventually broke up but they definitely left their mark on the local music scene.